Therefore, if employers missed the deadline, they should immediately evaluate whether the rule applies to any or all of their workplaces, get familiar with and set up an account in OSHA’s Injury Tracking Application, and submit covered injury data (i.e., their 2016 OSHA 300A Annual Summary data) by December 31, 2017. Historically, unless OSHA opened an enforcement inspection at an employer’s workplace or the Bureau of Labor Statistics requested an employer’s participation in its annual injury data survey, employers’ Injury and Illness Recordkeeping Logs and related forms remained strictly in-house. Employers kept the data and their OSHA logs in their HR or Safety Department office, posted them internally for employees to view for a couple of months each year, used the data themselves to make decisions about how to reduce risks of injuries and illnesses in their workplaces, and then stored the records in a cabinet or desk drawer for five years. Now, OSHA’s new rule requires hundreds of thousands of employers to proactively submit these historically private records to OSHA, which in turn may publish the data online for all the world to see. All establishments with 250 or more employees (in industries not exempt from keeping injury logs) must submit to OSHA annually their injury and illness data from their OSHA 300 Logs, 301 Incident Reports, and 300A Annual Summaries. In this first year of the rule, however, for 2016 injury data to be submitted in calendar year 2017, all employers, irrespective of size, are only required to submit 300A Annual Summary data. The submissions to OSHA must be made electronically, via a purportedly secure web portal. OSHA stated its original intent was to publish the data online, likely in a manner that is sortable, searchable, filterable, and as embarrassing to employers as possible. It is unclear whether the Trump Administration will publish the data, but the records may nonetheless be subject to Freedom of Information Act requests by plaintiffs’ attorneys, the media, union organizers, and competitors, to use the data in a variety of ways to harm employers. The deadline to submit data has been a moving topic and source of uncertainty since the Trump Administration took the reins at OSHA. The original deadline to submit data this year was July 1st. On May 17, 2017, OSHA announced an indefinite suspension of the original July 1 deadline, and later published a Notice of Proposed Rulemaking on June 26, 2017 to extend the submission deadline to December 1, 2017. The proposed rule was cleared by OMB last month, and that final rule reflected yet another change to the data submission deadline. After reviewing comments to the proposed rule to push the deadline to December 1st, and in consideration for delays launching the portal, getting OMB approval, and a brief stint when the portal was taken down because of a potential hack, OSHA tacked on two more weeks for a final data submission deadline of December 15, 2017. Now, by the press release OSHA issued today, that deadline, by exercise of OSHA’s enforcement discretion, will run through the strike of midnight on December 31, 2017. What, when and if data is collected in 2018 and beyond is far less certain. The Trump administration has taken significant steps towards amending or even rescinding this rule in the near future. 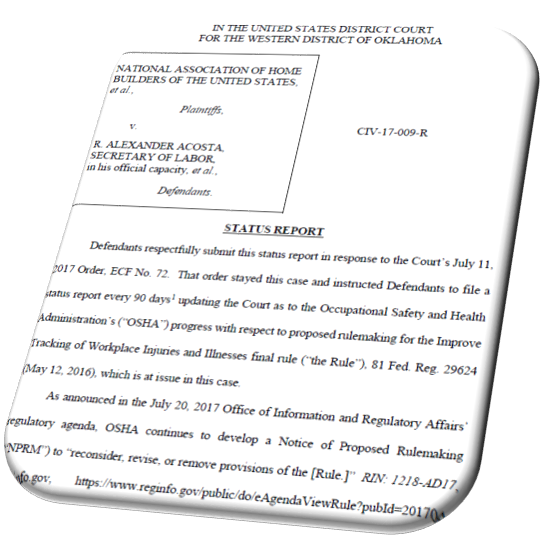 Immediately after the Rule was promulgated by the Obama Administration Industry opponents to the Rule brought a legal challenge to the Rule in the U.S. District Court for the Western District of Oklahoma, (Case No. No. 5:17-cv-00009). The Trump Administration joined a request by the Industry plaintiffs to stay the legal challenge because the new Administration indicated its intent to re-open the rulemaking to either rescind or amend the Rule. OSHA “continues to develop a Notice of Proposed Rulemaking (‘NPRM’) to ‘reconsider, revise, or remove provisions of the [Rule],’” as announced in Pres. Trump’s First Regulatory (and Deregulatory) Agenda issued on July 20, 2017. OSHA further explained that OSHA has “drafted substantial portions of the NPRM, including draft regulatory text and a summary and explanation of the proposed changes,” and that “OSHA’s economists have made significant progress on the economic analysis” and continue to refine it. This tells us two things. First, OSHA appears to be following through on its stated intent to revisit the E-Recordkeeping Rule. Second, it appears that the manner in which OSHA revisits the rule will be significant. The Administrative Procedure Act requires economic analysis of proposed rules only for substantial rulemakings. So, if OSHA was planning only to nibble around the edges of this Rule, there would not likely be involvement of OSHA’s economists, as reported. The next status report is not due until January 8, 2018, so we will have to wait and see what progress OSHA has made on issuing the NPRM. As of today, all elements of the rule are still in effect, including limits on post-injury drug testing and safety incentive programs, and barring a change in the next two weeks, which is unlikely at this point, employers should proceed to submit injury and illness recordkeeping data to OSHA. 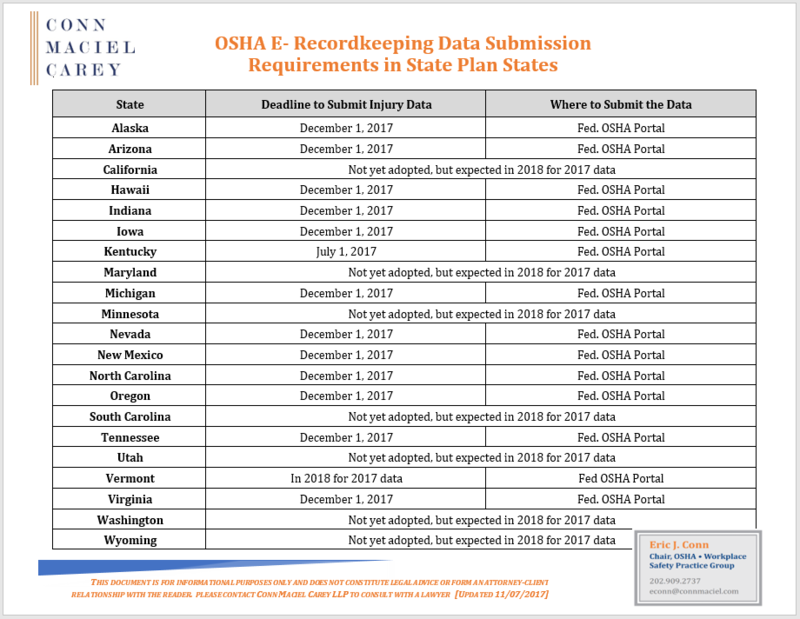 One important caveat to note is that several states that operate their own federal OSHA-approved State OSH Programs have not yet adopted a final version of OSHA’s E-Recordkeeping rule, including California, Maryland, Minnesota, South Carolina, Utah, Wyoming, and Washington. As explained in our prior blog post and the table below, employers in those states are not required to submit any data to OSHA this year. The OSHA Practice Group at Conn Maciel Carey will continue to follow this Rule closely, so look out for updates on our blog or feel free to contact us directly with questions regarding compliance with the Rule and how to properly operate the Injury Tracking Application.